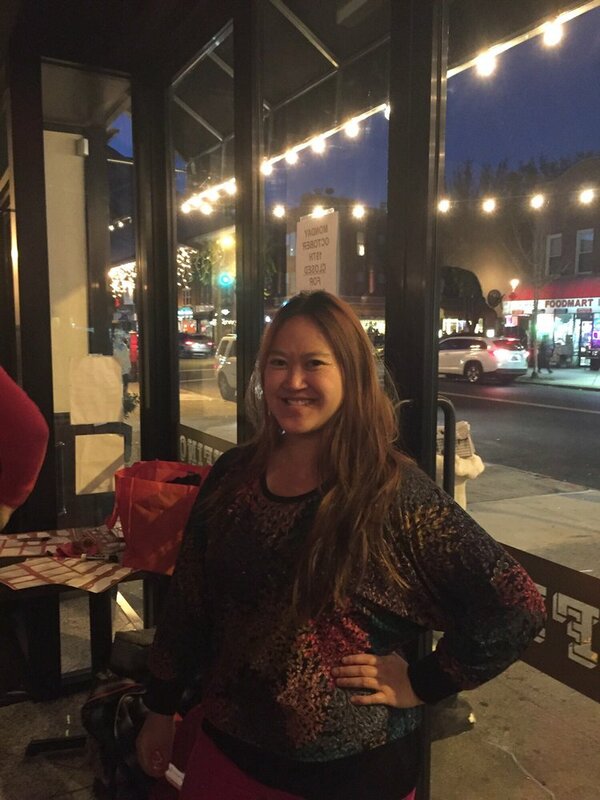 Last week, I attended two Yelp Queens Elite events. The first one was at Tufino Pizzeria Napoletana, where I thought we would only be served pizza and that I would get bored with the food. Oh, how wrong I was! The other event was at Spa Castle and it was already full with a few hundred person waiting list so I had pretty much resigned myself from ever getting to go. Luckily, Jando (the Yelp Queens Community Manager – get to know him, he’s awesome!) let me in and I had such an amazing, relaxing evening and you can read all about it below! Tufino Pizzeria Napoletana is a small, but cute and cozy spot with great atmosphere in the heart of Astoria. I loved the huge windows that lead to the street. It gave the place nice lighting and feel. The restaurant started us off with several amazing appetizers. 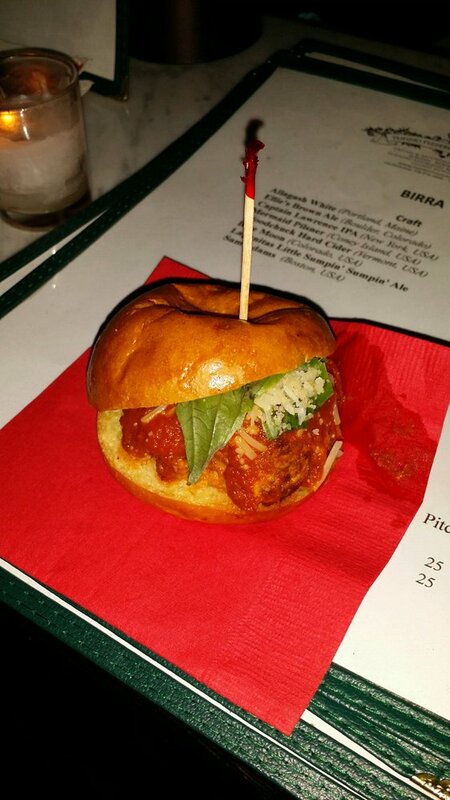 First there were mini meatball sliders (one of my favorites) with grated parmesan cheese and basil on a brioche bun. The meat was warm, flavorful, juicy and the basil added to the already delicious sliders. Then there were mini capellini cakes with vodka sauce that was fried to perfection and extremely crispy. They tasted a little bit like potato. We also had fresh mozzarella, tomato and bread crumb on skewers, which were light and refreshing. Next came the warm farro (a type of grain) salad with wonderfully tasting pesto sauce. 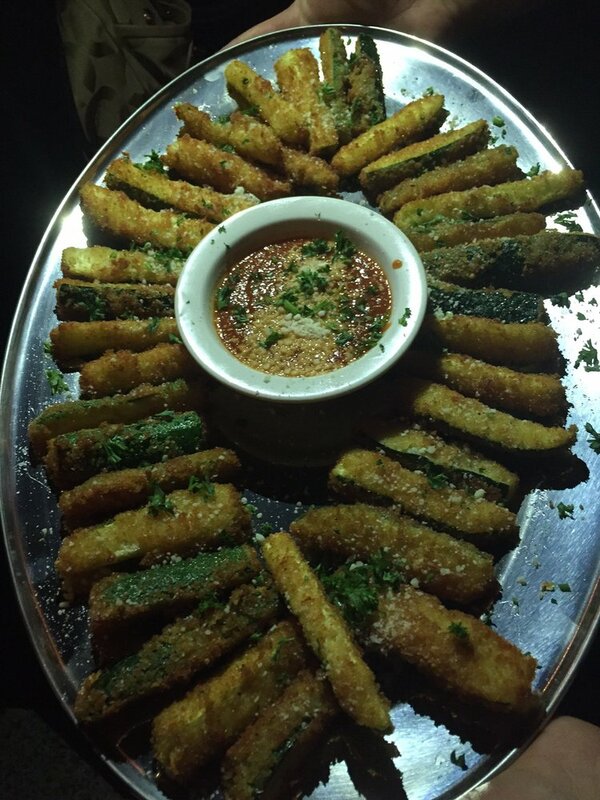 After that was another favorite of mine: Zucchini fries. They were hot and fresh out of the oven, with well seasoned breading and a light dusting of parmesan sauce. Soon after all those appetizers, the thin crust pizza started coming out. 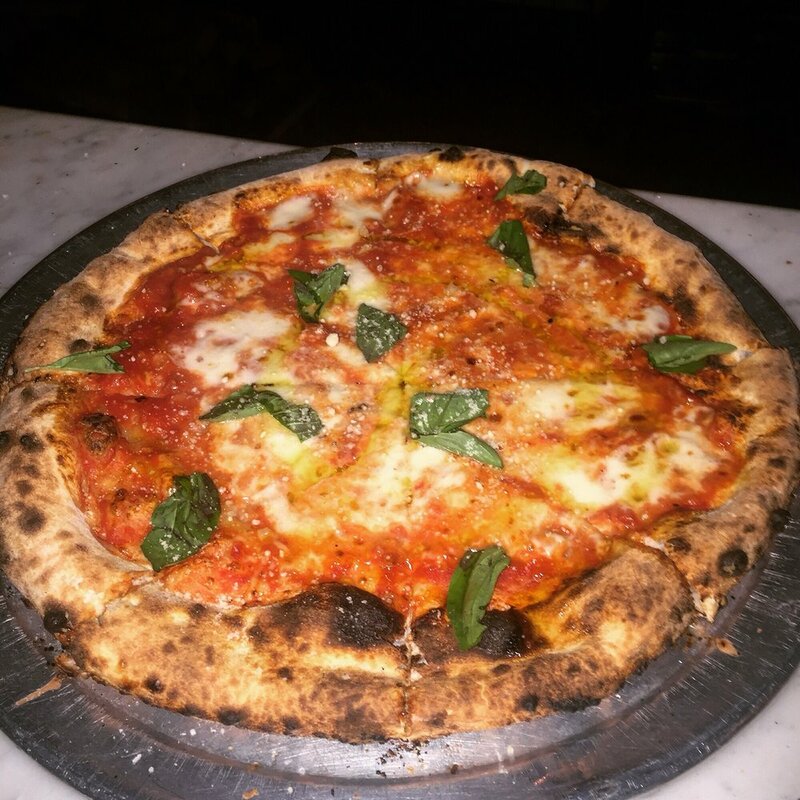 I tried most of the different types of pizza, starting with the Margherita, which was made out of organic tomato sauce, mozzarella, parmesan and basil. This was quite good but I preferred the other types of pizza that had toppings on them. 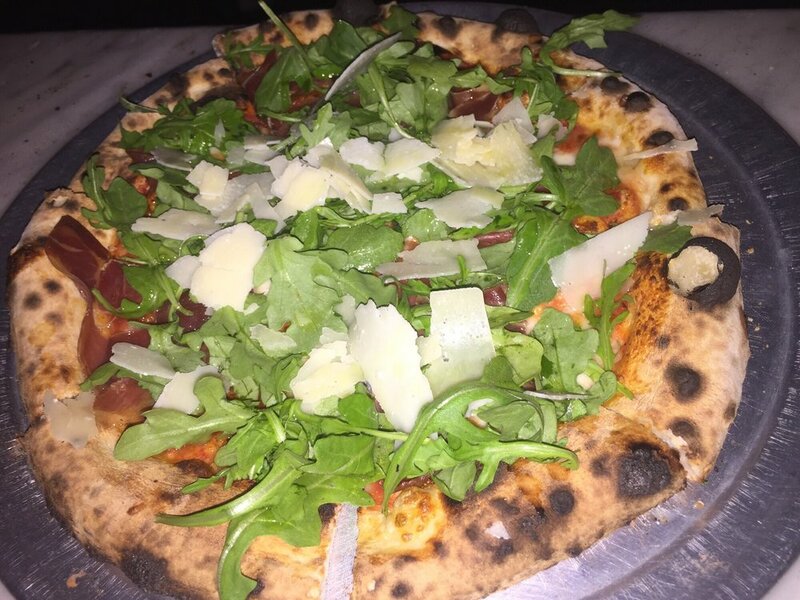 Prosciutto e Arugula came with mozzarella, prosciutto, lemon juice and truffle oil with baby arugula and parmesan shavings on top. This was wonderful, with delightful tasting meat and all the other flavors came together nicely. 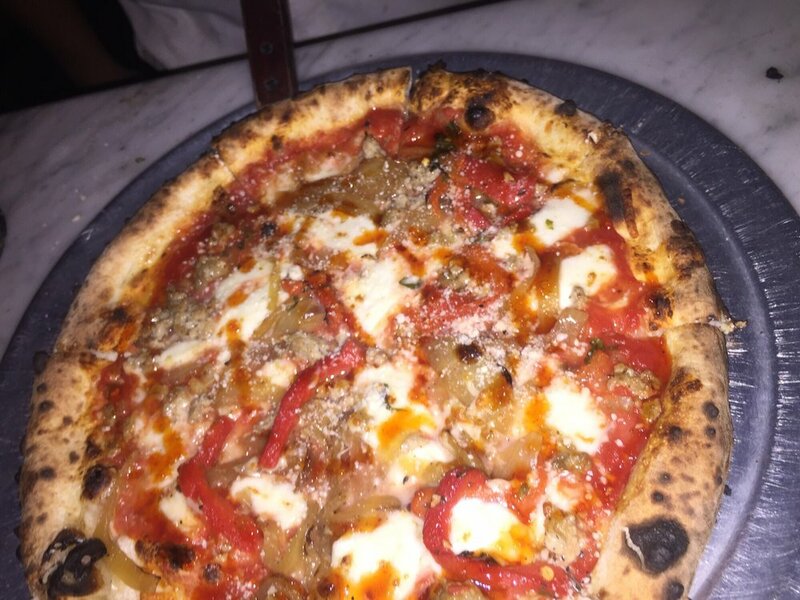 I also had the San Gennaro, which consists of mozzarella, Italian sausage, peppers, onions and parmesan. The sausage was savory and zesty. 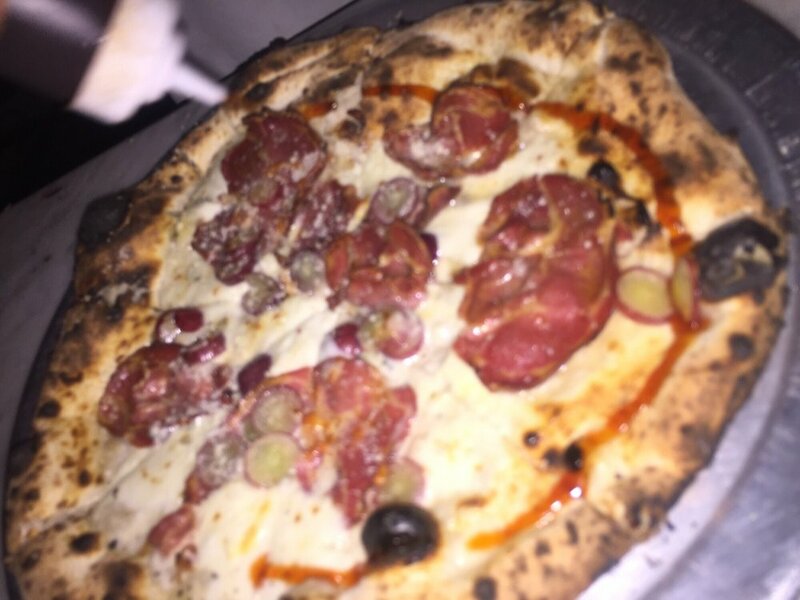 My favorite pizza of the night, however, was Grape Expectations, which had red grapes, gorgonzola, Italian pork (which tasted like bacon) and house made honey. The grapes on the pizza was unique and unexpected, but worked really well and combined flawlessly with the gorgonzola, meat and honey. It was a mix of sweet and slightly savory, and completely mouthwateringly delicious! The service was great, though I would have liked some options for non alcoholic drinks, besides water. But the servers were really patient, friendly and allowed time for some of the Yelpers to take photos of the food, then making sure we all got what we wanted. 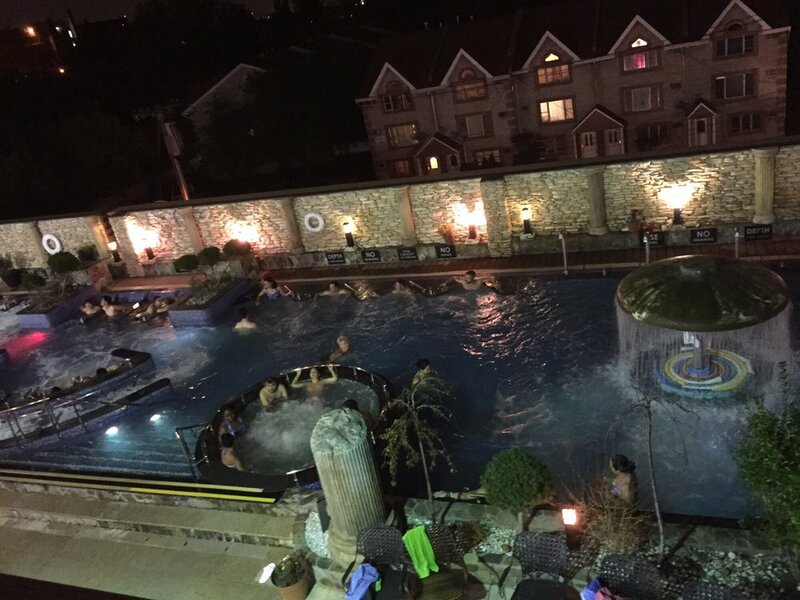 Then there was Spa Castle Night, which totally came at the perfect time because I needed to get my mind off of things and just totally chill & relax: CHILLAX! 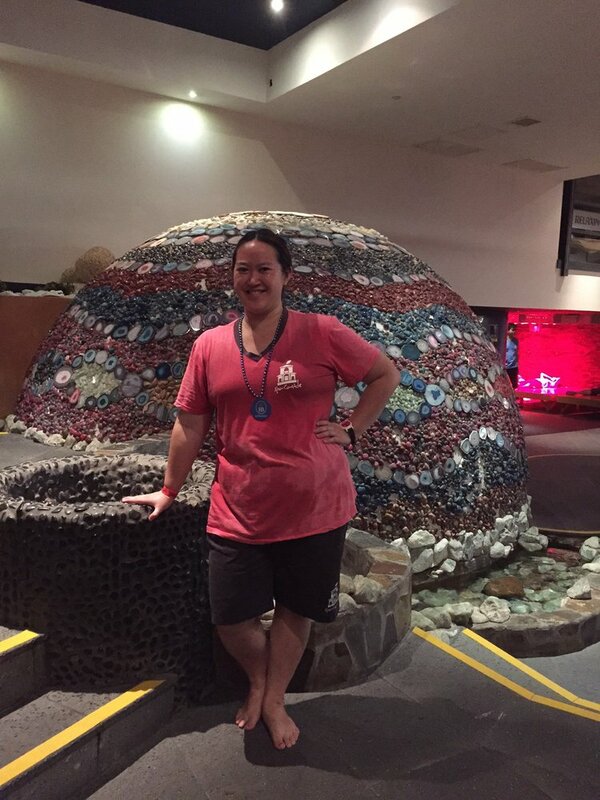 It was my first time at Spa Castle and what a wonderful elite experience I had! We were given watch keys which were ingenious… They connected to our very own locker and were also scanned when we bought anything- We were allowed 2 free drinks. They also gave us uniforms to wear around the spa and a small towel. I would have liked a bigger towel, because I was in and out of the pools throughout the night. First, I met some really awesome folks and we checked out the outdoor pools, which had a spraying area and also different massage water jets etc. There was also a nice bubbling jacuzzi. Then we checked out one of the pools inside which was right by the bar and had stools set up along side it. I don’t drink so I asked if the free drinks included any non alcoholic drinks. At first they said no, but then allowed me to order soda so that was really nice. Shortly after that, we headed to the upper floor to get some food. There was a lot of fried food which was tasty: Mozzarella sticks, chicken strips, french fries, fried chicken, shrimp tempura. 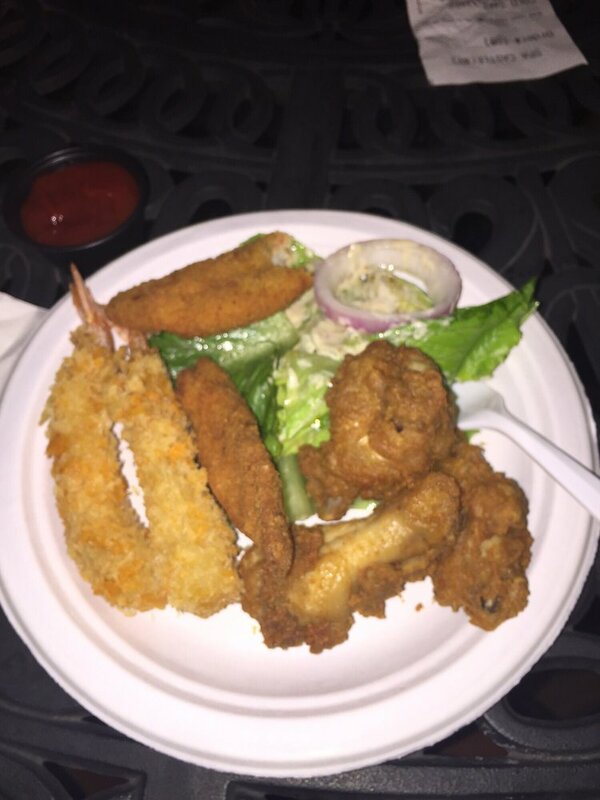 The shrimp tempura and fried chicken were my favorites. Also salad and delicious fruits: Mango – extremely fresh and sweet; pineapple – sweet and juicy; grapes – wonderful and sweet. It was nice to have that since the fried food was so heavy. After that we headed back to the outdoor pool area and tried out one of the body massage areas which was AMAZING! It was great to feel the water jets on my back, legs etc. 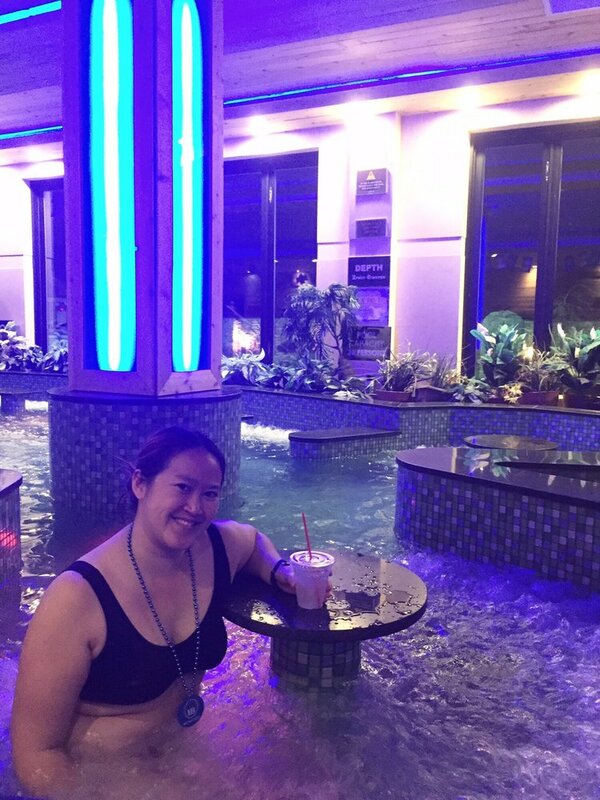 We also enjoyed the foot massage pool and our 2nd drink. Then I headed to Sauna Valley and I really liked the whole set up of it. There was a bridge, water flowing, and different colored lights flashing peacefully. I got some friends to join me in trying out all the saunas. We started with the hottest ones first and my favorite was the Gold Sauna. It was a nice temperature, not too scorching and there was a bench to sit on. 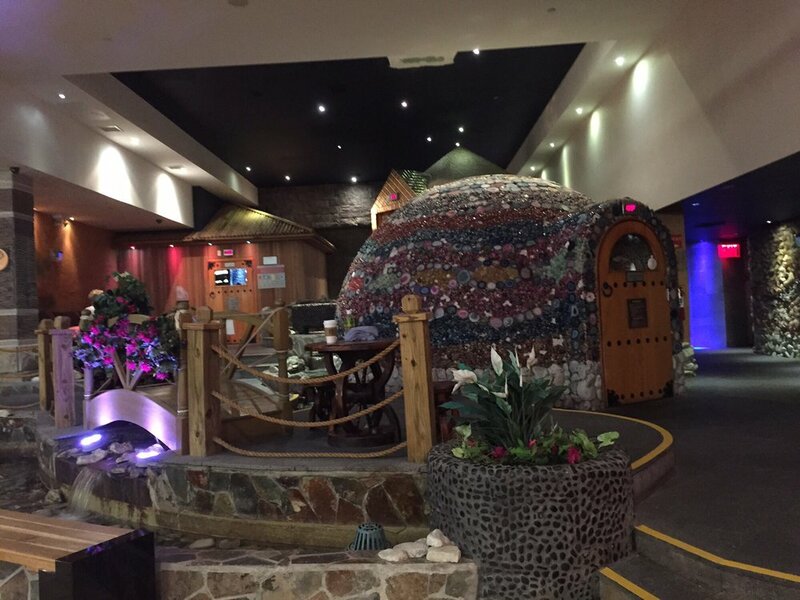 The most aesthetically pleasing was Jade Sauna which was a dome with gorgeous colors and stones, but at 180 degrees it was a little too warm for me. I also laid down in the infrared zone for a little bit. It was okay. I didn’t feel much of a difference after. I just laid out on the long chairs after and then headed back to the locker room. There was a nice area with a massage chair and comfy blue couches just for the girls there. The one complaint I had about Spa Castle is that it was confusing to navigate and I didn’t even see/know about some of the amenities, such as the Ice Land, which would have probably been my favorite room of all since I LOVE ice! Thankfully, we received a free certificate for another visit, so I will definitely check it out when I come back. 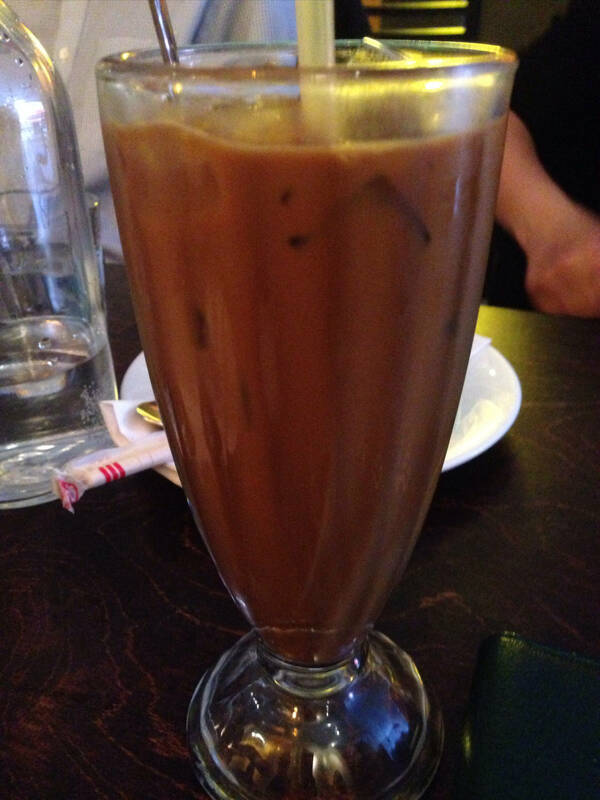 I went out with friends to Sao Mai Vietnamese restaurant and we ordered family style, so that we would be able to enjoy a wide variety of dishes.I started off with the Vietnamese Iced Coffee, which was quite strong and not creamy/sweet enough for me… It didn’t enough condensed milk, but it was still pretty good. 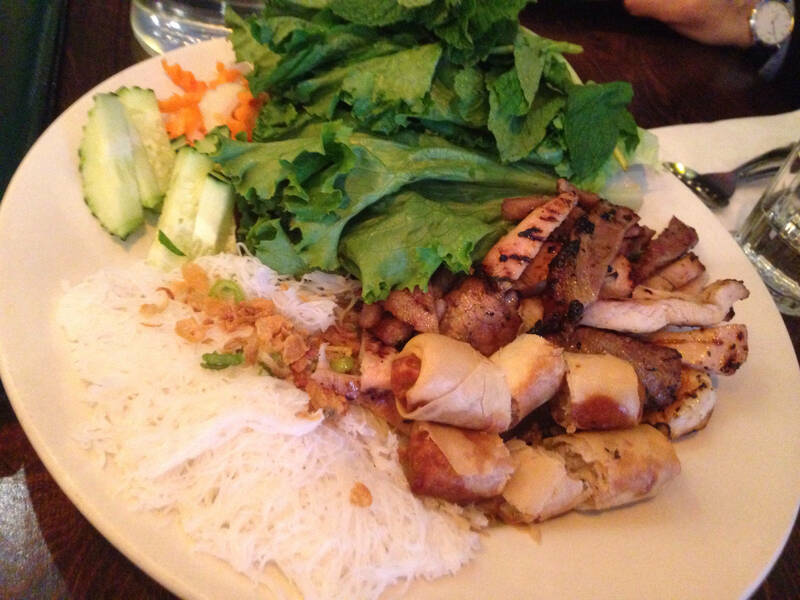 We tried many different appetizers, such as the house special platter, which consisted of spring rolls, barbeque chicken, pork and beef and was served with lettuce, pickled carrots, mint leaves and light sweet dipping sauce. I enjoyed the barbeque meat, which was charred slightly (the way I like it). 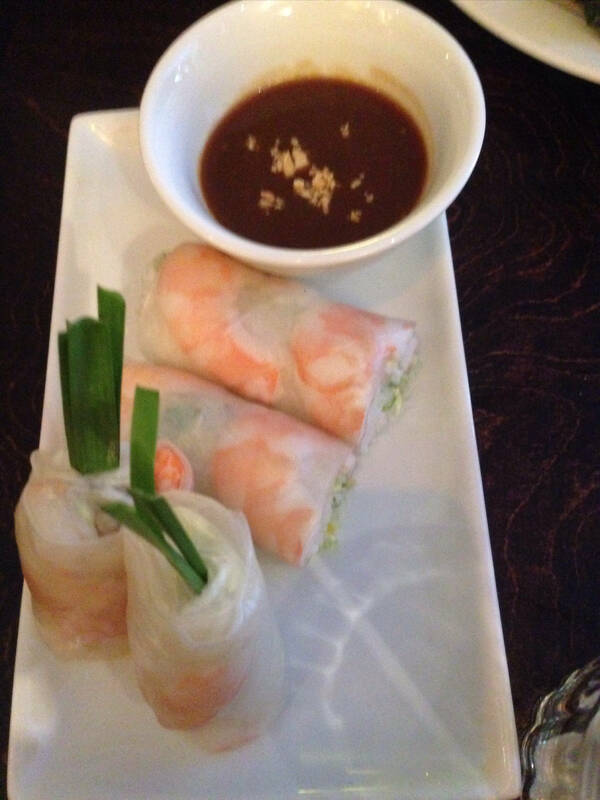 I also really liked the shrimp summer roll with lettuce, mint leaves and vermicelli noodles, wrapped in rice paper and served with peanut sauce. The summer roll was delightfully airy and wonderful. Another appetizer we had was a steamed rice crepe, with minced pork and mushroom which was not one of my favorites. 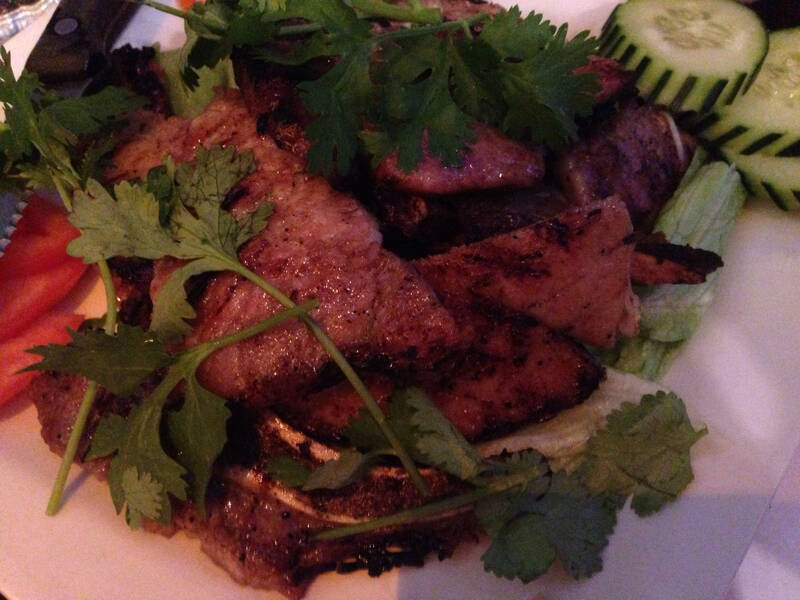 As for the main courses, we selected one dish per type of meat/fish/veggie: Lemongrass chicken, beef cubes, grilled pork chop, crispy whole fish and tofu with mixed vegetable in traditional Vietnamese sauce. The chicken had a nice flavor to it, while the beef was succulent, juicy and tasty. The pork chop was cooked perfection and had very nice seasoning. 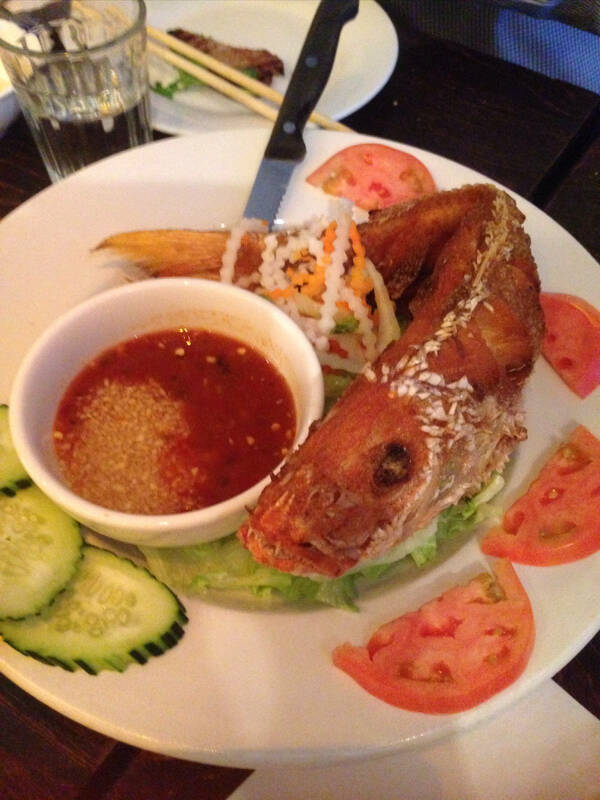 The crispy fish was red snapper with a ginger lime sauce and while it was a bit difficult to cut, it tasted delicious with a great amount of crunch. Overall, a very full and fulfilling meal. The only downside was that they do not have any dessert, but all was not lost! 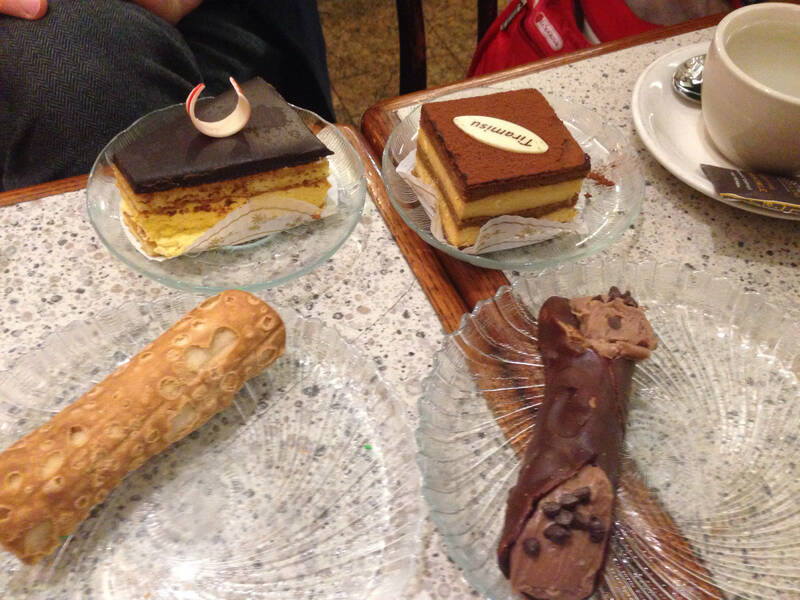 Afterwards, we headed to nearby Veniero’s pastry shop. For once, I was actually did not need to have my own dessert so we shared amongst ourselves. I tried a little bit of the blood orange/chocolate cake and some of the chocolate cannoli. Both were quite lovely and enjoyable, especially the chocolate parts. The orange cake had a nice delicate quality to it and the cannoli was a bit richer with a more robust sweet flavor to it. 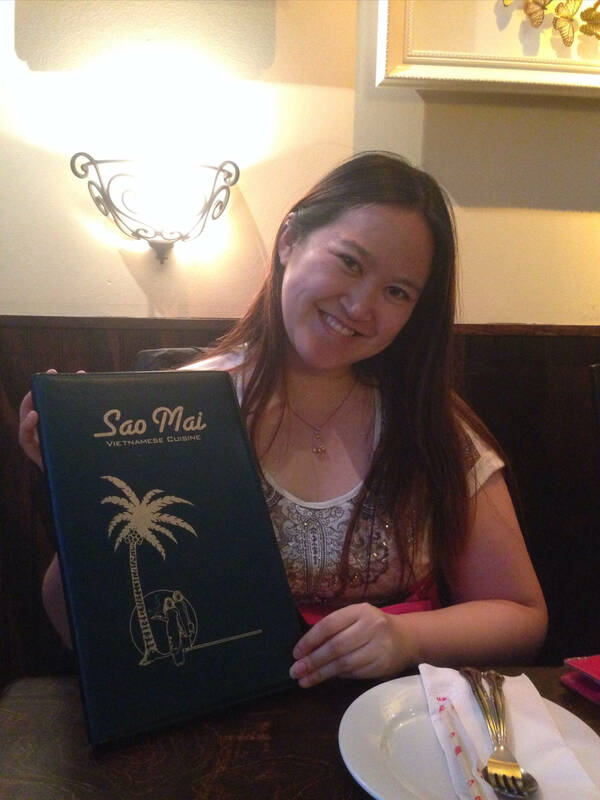 It turned out to be a great night of culinary treats and was happy I had the opportunity to try so many different menu options first at Sao Mai, then at Veniero’s.